Good Little Soldier, a work by Australian performance-maker Mark Howett first presented in Berlin and newly staged in Perth by Ochre Contemporary Dance Company and The Farm, deals with post-traumatic stress disorder in soldier veterans. After an opening scene set in an outback kitchen, we are briefly thrown back to Frank’s wartime experience in which he and his comrades capture a woman and a boy. Frank releases the boy to assist his colleague in pinning the woman to the floor. A bomb explodes and only Frank survives. The way in which his own family (wife Trish and son Josh) can be read as his enemies returned to haunt him is thus made clear. Otherwise the work offers few allusions to either wartime experience itself or to how Frank recalls it. It is rather an exploration of the physical and emotional abuse that he inflicts on his family as a result of his trauma. The focus is therefore quite different from works like Angus Cerini’s Debrief (1999) or the National Theatre of Scotland’s Black Watch (2006), both of which included accounts of battlefield experiences and interviews with veterans about how events were replayed in their memories. One of the most terrifying stories Cerini related was how one man awoke with his hands around his wife’s throat. Good Little Soldier is in this sense an extended dramatisation of such later, domestic events. But what is actually occurring in Frank’s mind, or indeed the others’ minds, is only darkly refracted — rather than explicated — through his abusive behaviour. The strength of the piece lies in the way it segues between domestic situations which could plausibly be occurring in a ‘real’ world, into unambiguously hallucinatory scenes. 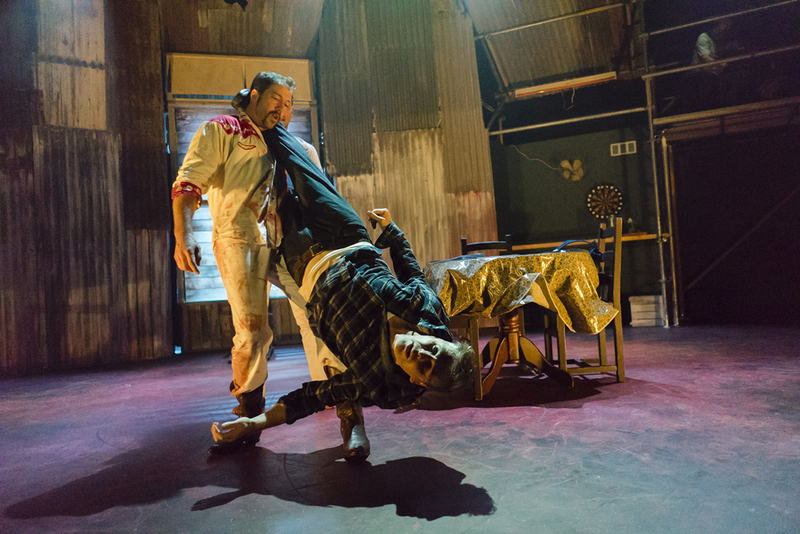 Frank is silhouetted against the window as his ghostly, white-attired dead comrades climb down the walls and suspend his squirming body in the air (crawling down walls has been a choreographic trademark of The Farm since Lawn, 2004; watch trailer here). In another striking sequence, Frank, spotlit from above in the darkness, pushes violently against Trish, before she is replaced by each of the ghosts, and then Josh, in a circling wrestling competition that cannot be resolved — the characters endlessly swapping places and matching each other. 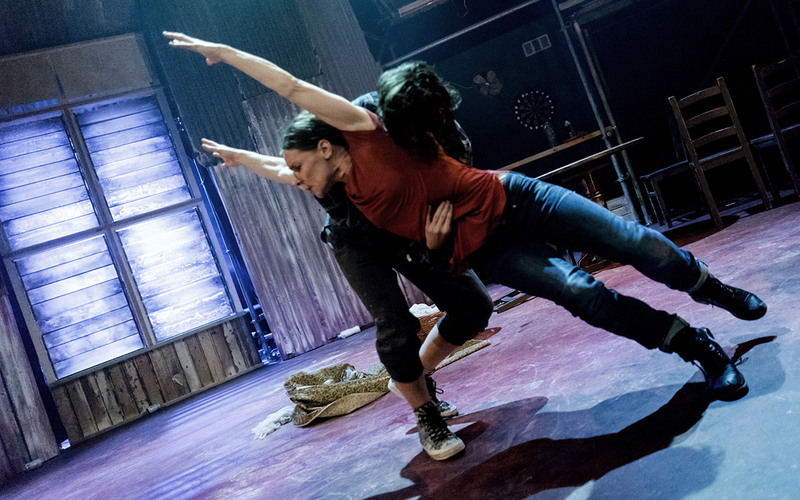 Choreographically, the piece is dominated by awkward, violent grappling and pushing: a messy rolling and bumping of bodies which form clumsy, writhing piles or temporarily balanced, off-centre structures, before tumbling down. As with Lawn and other works from The Farm, dancers hang off each other from unusual points, such as the head and neck. Faces seem more sites to push fingers into, or to wrap palms across, rather than sites of expressivity. Good Little Soldier is episodic with each semi-pedestrian set of gestures, or slapping and physical configurations, caught in repetitive cycles. This has a nasty, imprisoned feel to it, but the production is otherwise somewhat flat emotionally. Frank finally raises his hand to strike Josh, and at one point he dons Trish’s dress before slamming himself repeatedly against the wall. These two acts of shocking violence against his loved ones, and, by implication, against himself (to hit Trish is also to hit himself), act as markers within the protagonist’s breakdown. But otherwise the transition from opening to conclusion is horizontal and open-ended. Each scenario is established before being repeated with minor variations, ending with an exhausted collapse, or a character’s departure. Dramatic development within scenes is rare, and their arrangement largely discontinuous. Therefore the affective content depends heavily on the superb music of Dale Couper and Matthew de la Hunty, together with Laurie Sinagra’s sound design — as is consistent with The Farm’s overall multimedia aesthetic. Speakers are secreted beneath the seating banks such that leviathanic bass rumbles grind throughout the venue, engulfing audience and performer alike. This sense of the corrugated iron shed which the family inhabits as being something we too are trapped inside, is accentuated by regular entrances and exits through the auditorium, or a moment where a drunken Frank thumps under the seating, asking Trish to let him into the house. Couper and de la Hunty’s immersive score runs from low frequency noise music (signifying the war and moments where Frank slips into trauma), through to pulsing synthesisers recalling 1970s kraut-rock, distorted blues/country-and-western guitar solos, as well as manic junk percussion akin to early Hunters and Collectors (which featured Greg Perano on broken water heaters). The overall effect is like a more than usually theatrical gig from The Birthday Party. 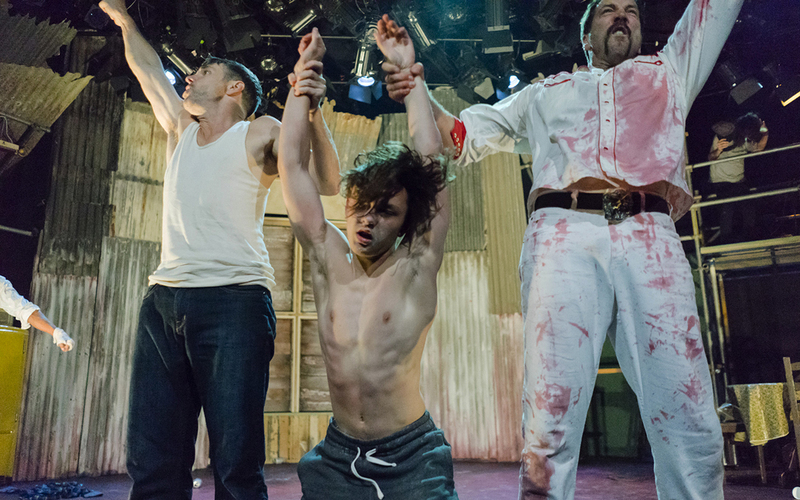 The overall dramaturgy of Good Little Soldier feels at best loose. The expressivity of the work echoes instead the slightly rough aesthetic of the outback-style design, post-punk music and deliberately fumbling choreography. It functions more like a series of related installations. This is arguably the most ‘German’ aspect of the show (referred to by Mark Howett in a RealTime interview), placing it firmly within Hans Thies Lehman’s category of post–dramatic theatre. Good Little Soldier is best seen as a striking collection of thematically related set-pieces, giving the performance an absorbing sense of danger and possibility.